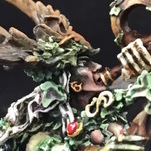 This blog will document my progress in building a Skaven Blood Bowl pitch which will also be part of a larger modular sewer complex for Age of Sigmar. I will also discuss some of the model making techniques, tools and materials used during this project. I find the idea of building a Blood Bowl pitch incredibly appealing. It's a relatively small project that has the potential to look great. It can also be extended with the addition of a stadium with grandstands and scoreboards.  In choosing to build a sewer themed pitch for Skaven this also lends itself to be the initial part of a larger project to build a sewer themed 4'x 6' AOS board. I first played Blood Bowl way back in '88 when I first became aware of Games Workshop and tabletop Wargames. It was actually the Blood Bowl miniatures in White Dwarf 108 that started my interest in the hobby. I had a few games with a friend and subsequently purchased Dungeon Bowl but never really amerced myself into the game. This latest release has piqued my interest as it has a lot of nostalgia for me, it's easy to get into and has the potential for lots of cool updates based on previous incarnations of the game. I've chosen Skaven as I've wanted to paint them for a long time and I think they look so cool. This also gives me a chance to make a start on a project that I've been thinking about for some time. Whilst at the Realms at War AOS event in Cambridge I had the opportunity to catch up with @Wayne kemp, the Skaven Master, and discuss what would be the ultimate AOS table/terrain. When I posed this question Wayne was very eloquent in saying that the ultimate AOS table doesn't exist as everyone has a different idea of what would be the ultimate. His ultimate table would be a Skaven theme, probably sewer themed whereas he said @Dan Heelan would probably prefer a Lizardman theme. I really liked the idea of a modular sewer themed board for AOS as this has the potential to be a multi-system board, possibility of being used for other games, say 40k. I'm not a 40k player but have been collecting Genestealer Cults which lends itself to this sort of environment. I've also wanted to build an urban board for some time. I came across this amazing blog, http://privateerpressforums.com/showthread.php?176894-Magnetized-Modular-Sewer-Cavern-Board-(WIP) , some years ago and have wanted to do something similar ever since. Unfortunately the blog seems to have stalled but there's plenty of great inspiration in there. 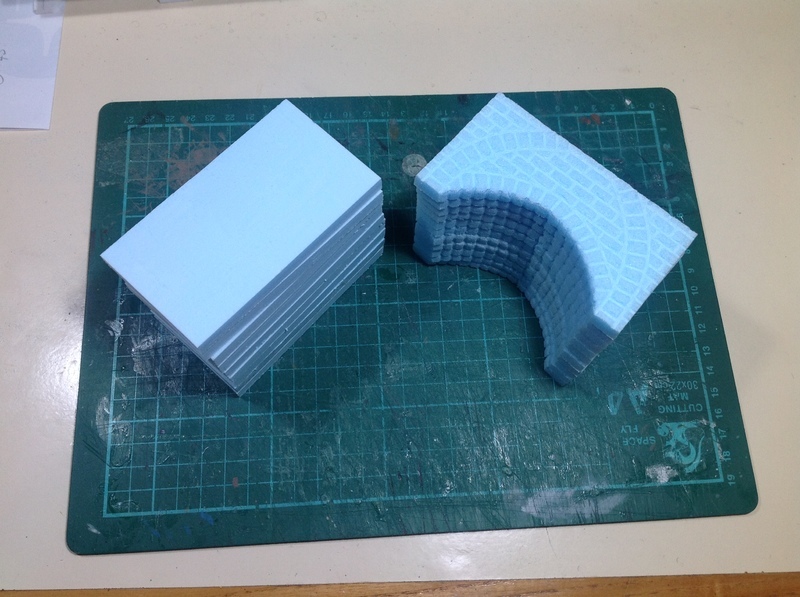 Building a modular sewer themed board also gives you the potential to build a multi level board which seems to quite popular in AOS at the moment. So my initial plan is to build a sewer themed Skaven Bowl Bowl pitch. Fortunately each half of the pitch fits into a 2'x2' square allowing me to use the two halves as separate modular AOS terrain. 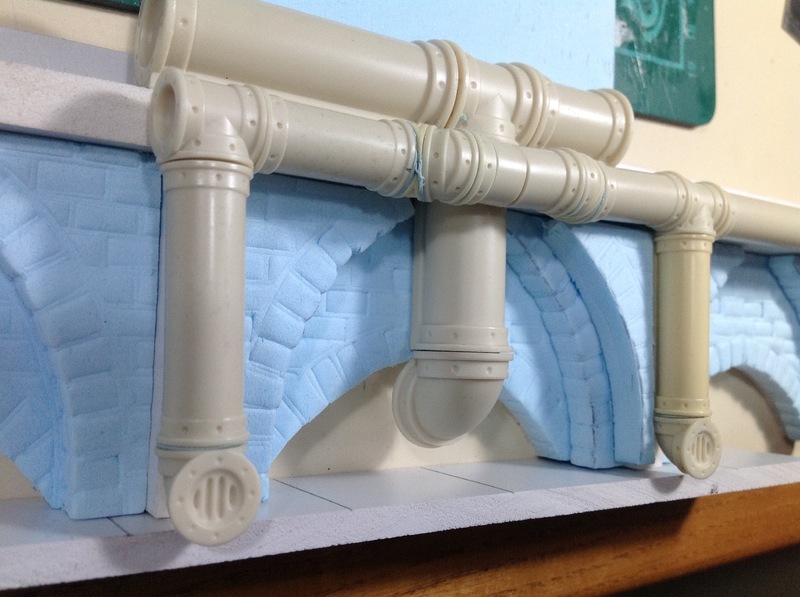 The design will be based upon a Victorian style brick sewer with lots of arches and pipes for added Steampunk Skaveness. The pitch will be elevated on a plinth that rises out of the surrounding sewer which contains industrial pipe machinery. 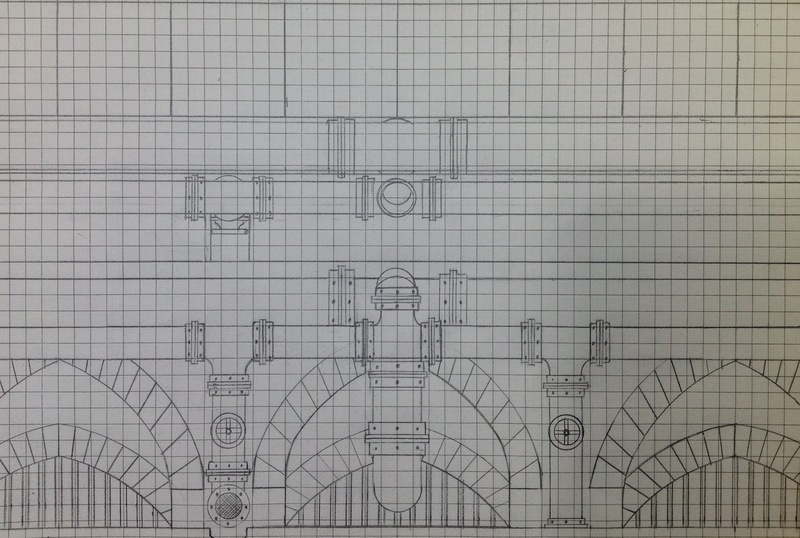 The bottom half of the drawing below illustrates the brick and pipework design to be used on the sides of the plinth whilst the top shows the top of the plinth with the pitch squares. I always use squared paper to draw designs for model making projects. I find it makes it a lot quicker and easier to draw, particularly when drawing buildings. I next had to decide what materials I would use for the construction. I wanted the model to be lightweight and durable as it would need to be transported from place to place. 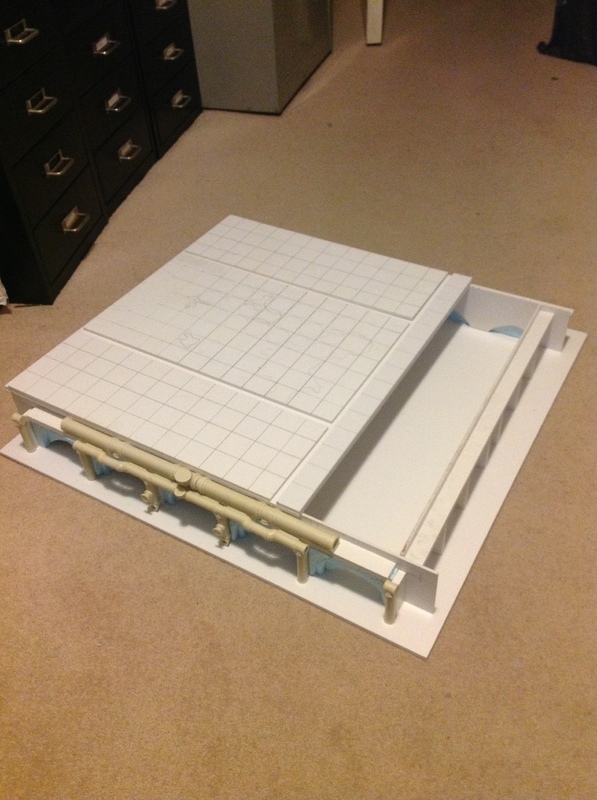 I construct nearly all my architectural terrain pieces using sheets of expanded pvc. I have used this for decades, it is lightweight, strong, easy to cut, glue and sand. It also comes in various different thickness from 1mm to 30mm. You can also score texture into it's surface to create different textures such as wood grain, brick or stone. 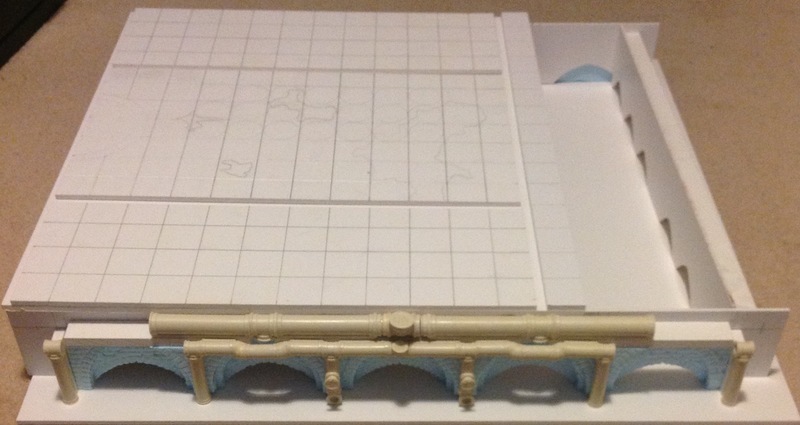 However for this model I would he using it soley for the structure and the paving of the model. 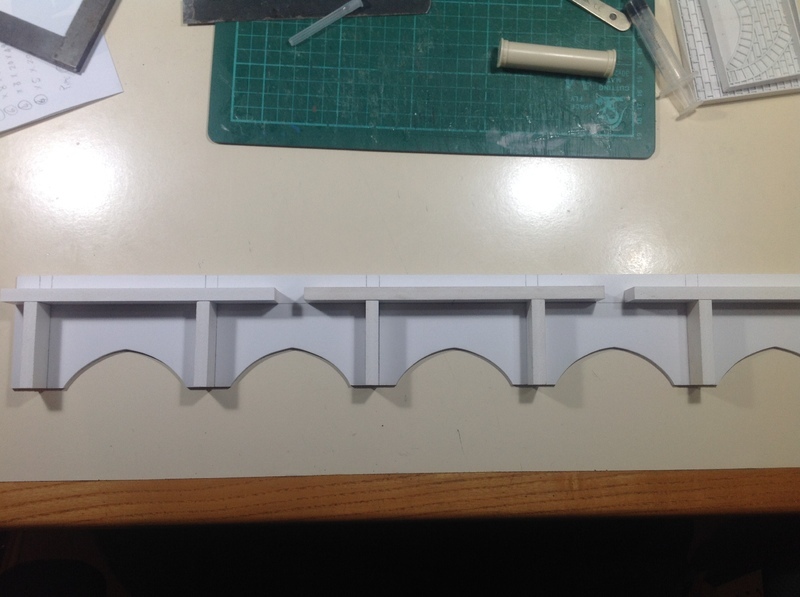 The base / flooring is 5mm, the walls are 3mm and the buttresses and pipe shelf are 8mm. 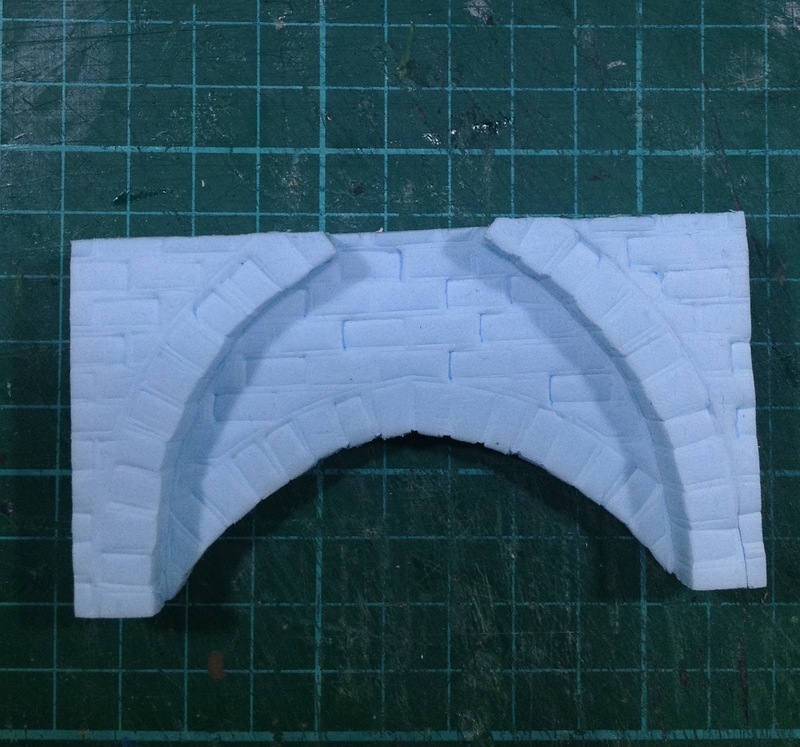 I wanted to give the sides, which would be made up of brick arches, more texture and depth so I opted for blue foam (styrofoam). The tools I use for working with expanded pvc are; technical pencil, cutting mat, Swann Morten scalpel, engineeers square 7" & 5", steel rules 6" & 12", sanding block 400 grade, superglue and zip kicker. For expanded pvc thicknesses greater than 5mm I use a circular table saw for cutting. I've not used blue foam much but understand the principles of the material. 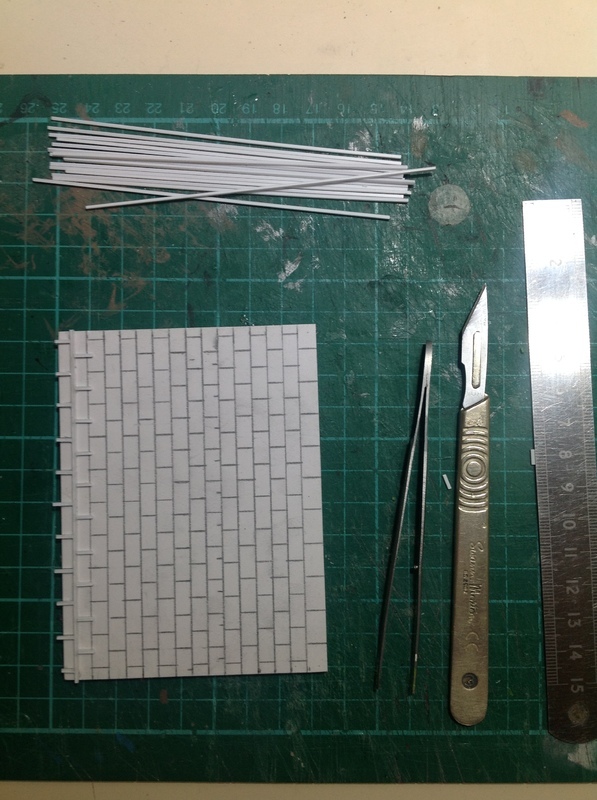 When creating brickwork in foam I would usually use a biro and draw the brickwork straight on causing the brick work to be engraved. Whilst this can look good it can be inconsistent and can look untidy. 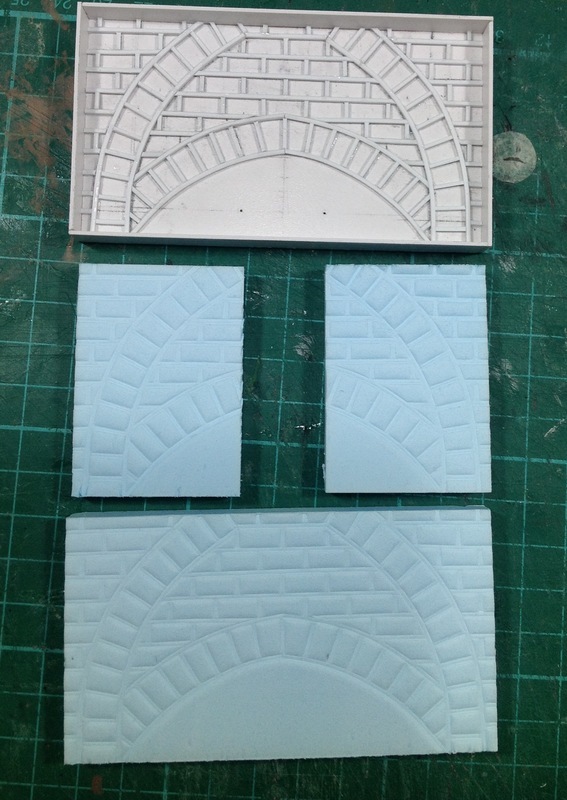 This is a reasonably lengthy process due to hand drawing each piece and I wanted to have identical brickwork on each arch. So I came up with the idea of printing each styrofoam piece. I can't imagine this is an original idea as it seems so obvious however I have not seen anyone else doing this. The idea is based upon the original printing process of block printing developed in the middle ages. 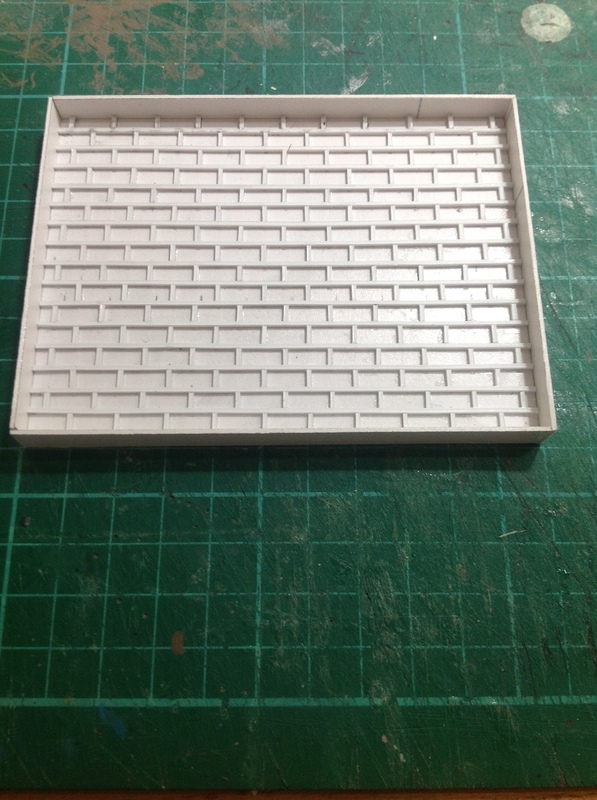 Styrofoam is a soft material that can be indented, so I created a 'negative' brickwork mould in which a piece of styrofoam can be pressed into using a press. 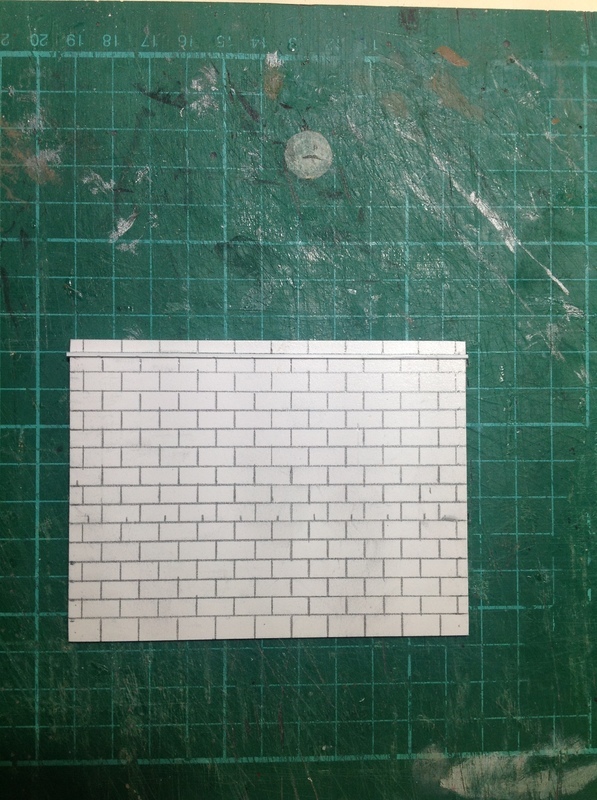 The mould was made from a base of 3mm expanded pvc, the brick design drawn on then the mortar was added using 1mm styrene strips. 1mm expanded pvc was used to build up the sides to hold the styrofoam in place. 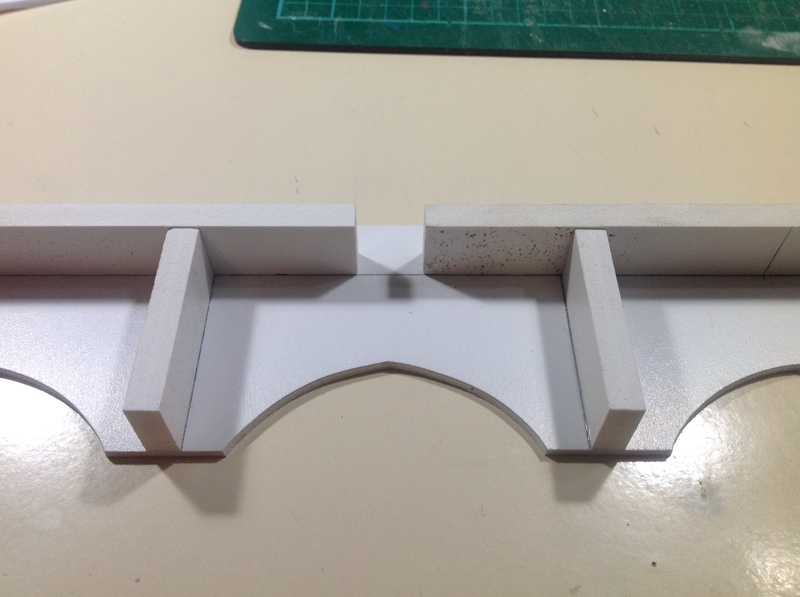 The styrofoam was cut into strips 9mm thick using a bandsaw which were then sanded smooth to a depth of 7.5mm and cut to size to fit the mould. 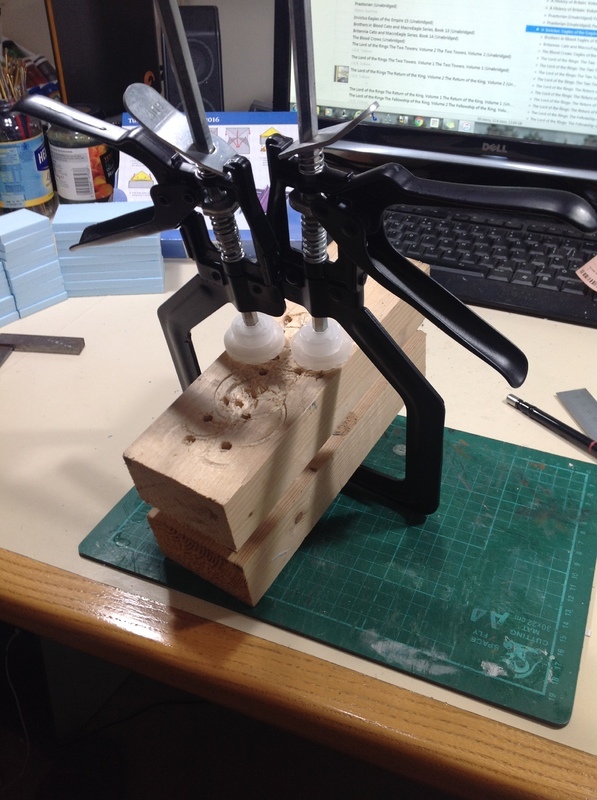 As you can see from the pic below I used two blocks of wood and some clamps to create the press for the mould. 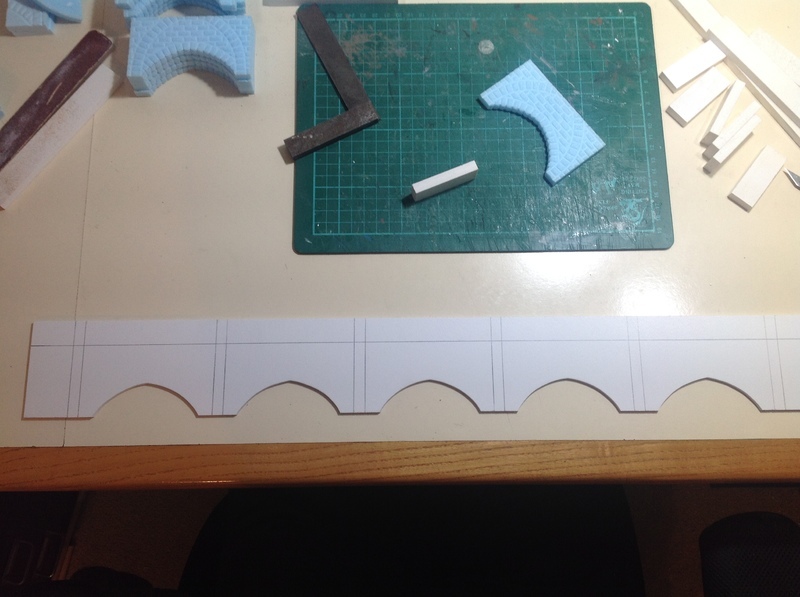 To create depth to the walls I printed smaller pieces of foam to be added to the arches. The printed pieces were then cut and glued. This worked incredibly well, was very quick to use and I was churning out brickwork styrofoam like a Victorian workhouse. This was helped massively by @Mitzy for supplying me with a massive chunk of blue foam. 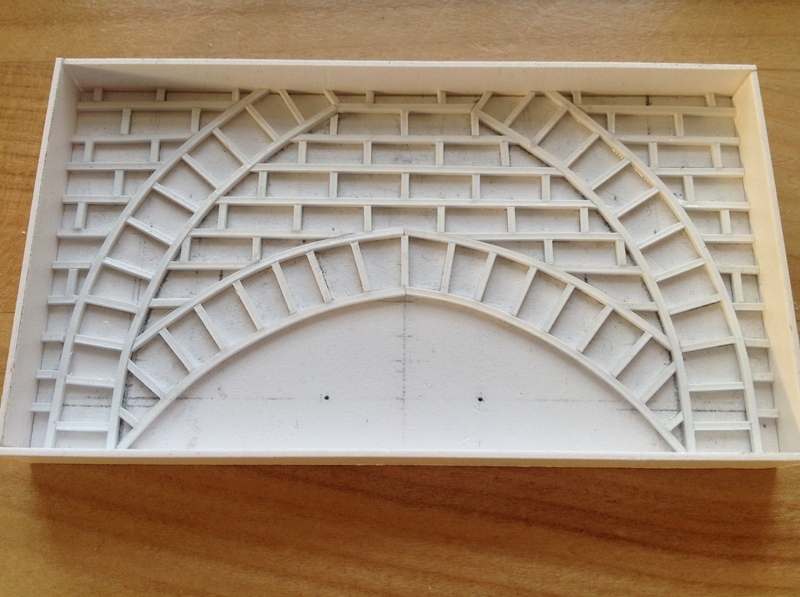 I created another 'generic brick' mould to use for any plain areas of brickwork I would need. To add a little variation to the brick depth I depressed some of the bricks using a piece of plastic. For the pipework I used Hirst Arts pipe moulds 320 & 321 which are fantastic quality. These are quite expensive but having a mould means you can have as much pipework as you like. I used 'low odour' fast cast polyurethane resin as I wanted it to be very durable and Quick to produce. Fast cast resin has a de-mould time of approximately 30 mins. I would need a lot of pipework so I ordered 1.5kg of resin. 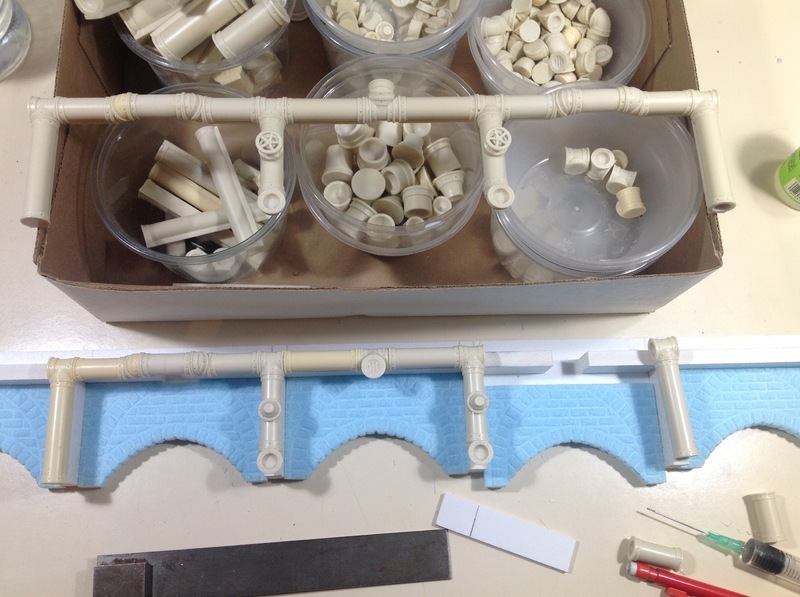 The two moulds would give me a variety of pipe pieces in two different pipe diameters. This should give me enough variety to make the pipework sufficiently interesting. Here's a wip pic of half the pitch. The space to the right of the pitch will be the dug out area. The squares on the pitch will be paving and the different zones are divided by gutters recessed into the pitch. The pitch will also have drain covers. It looks awesome already. Can't wait to see progress! 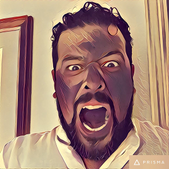 Brilliant article, thanks for sharing. At fist I thought you had used the 40K Promethium Pipes. The Hirst Arts molds have worked a treat. Looking forward to seeing how this progresses. How well do the Hirst molds hold up to the Resin? Does that degrade them much faster? They hold up just fine, you can make moulds last longer by using silicon mould release spray or by dusting with talcon powder, I don't bother though.